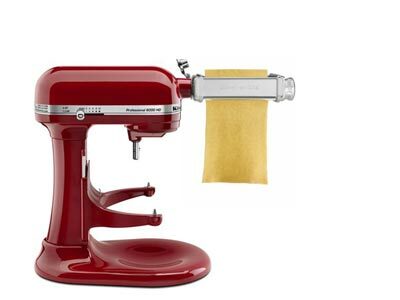 Bring the taste of fresh pasta into your home with this KitchenAid® Stand Mixer attachment. The pasta roller helps you guide sheets of just-made dough through to the desired thickness. You can then cut the pasta yourself into thick pappardelle noodles, squares for large ravioli or long sheets for lasagna. Or pair it with the KitchenAid® Stand Mixer Pasta Cutter Attachment Set, also available from Kaboodle here. Oh no I missed this great deal … I need a cheap Kitchenaid Stand Mixer so much 😦 But anyways thanks for your offer!